"Was Edison nervous during the 'death watch' test? Edison never was nervous!" The speaker was Francis Jehl, the last survivor of those who stood beside Thomas Alva Edison at Menlo Park, N.J., during the forty-hour test which, on Oct 21, 1879, produced the modern incandescent electric light. In one of the last interviews before his death, which occurred in St. Petersburg, Fla., last Sunday, the eighty-year-old Mr. Jehl, born and bred in old gas-lit New York, once more was telling the story of the inventor who, he believed, was the greatest man in the world. "Edison did more for humanity than all the governments that ever existed," he said. "Edison gave man the courage to go out and explore the domains which he opened for them to explore." 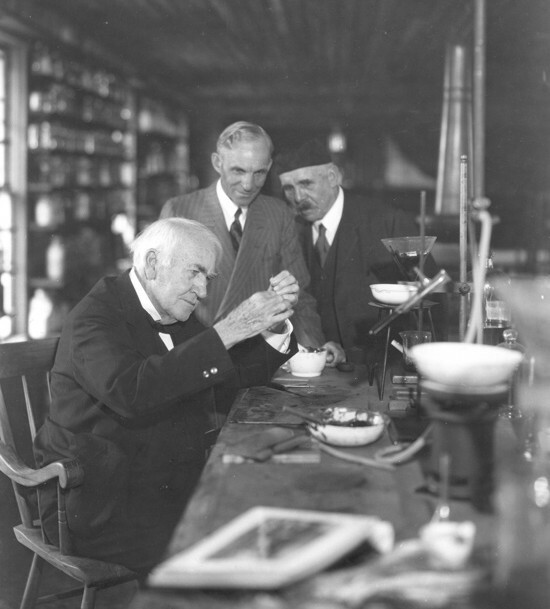 Mr. Jehl's skullcap was black, like the one Edison wore. His hair was white, cropping out below his cap. He was gnarled, but his eyes shone as he reminisced. When he said he would bring out the third volume of his "Menlo Park Reminiscences" in 1941, "if I'm alive," his voice was warm. About him there at Dearborn, Mich., was his sanctuary, Henry Ford's restoration of the Edison laboratory at Menlo Park. Mr. Jehl had participated in one of the greatest moments in history, and he was bent on telling the world that story. The first two volumes of his book, unfinished at his death, have done much to perpetuate the memory of Menlo park as any writing that has come off the press in recent years. Mr. Jehl was a disciple of Edison and he passed his life in spreading the gospel of the inventor. Thousands here and abroad had heard Mr. Jehl's Edison story. Among them in Berlin in the 1880's was Emil Rathenau, whom he knew as "a poor man in a faded coat," but who was one of the greatest Edison pioneers in Europe; also Professor Guiseppe Colombo, founder of the great electrical system at Milan. "In Vienna I was invited to court by the Emperor Franz Josef, and had one of the greatest thrills of my life," Mr. Jehl told the writer. "I spoke with him in the Hofburg Palace. It was like a fairyland, filled with officers of the various regiments of the old Austro-Hungarian Empire. Edison was a great man, the Emperor told me. He said that when Edison invented the phonograph he had instructed his ambassador to send him one right away. I spoke to him in broken German and told him about Edison and his work." Many years later, when he was in Budapest, Mr. Jehl was decorated by order of the Emperor. Franz Josef, incidentally, must have been more far-sighted than another Austrian of that day, Baron Rothchild, who had written New York's August Belmont that the microphone, phonograph, etc., have finally proved to be only trifles." The baron's letter, still unpublished, was dated "Vienna 25th October 1878." Born of immigrant parents in New York's East Side, on Sept. 6, 1860, Mr. Jehl made his way to fame, but not to fortune, through an acquaintance with Grosvenor P. Lowrey, general counsel of the Western Union Telegraph Company and a founder of both the Edison Electric Light Company and the first Edison company in New York. Mr. Lowrey raised the cash funds with which Edison began his electric light invention period at Menlo Park. "Can you make use of a sturdy strong boy about sixteen years old who has been for several years in our office, and, upon my recommendation, for nearly a year now in the Western Union Shops, under Mr. Phelps. "This young fellow is a German, named Francis Jehl, and although he has a rather awkward appearance, and manners, and is rather slow and might seem to some to be stupid, he is quite an intelligent, industrious, faithful, honest and high-minded young fellow. He has always been greatly interested in electricity, and while an office boy used to make magnets and little electrical machines which he brought to the office. They were, of course, only imitations of others, but showed a mechanical turn of mind, and a strong love for the subject of electricity. We should have kept him as long as he wanted a place, but his enthusiasm overcame him and he begged me to get a place with Mr. Phelps. "He has been kept at the most uninteresting work (I think boring holes and washing bottles, and that sort of thing) and although he would be perfectly willing to do that if he was surrounded by men or things which interested him, he cannot do it there, for, he says, the men and boys are all flatterers of the foreman and do not work honestly and right....I have promised him to write to you. "I do not think Francis' dissatisfaction of Mr. Phelps is because of the meanness of the work which he is set to do, but because, having entered the shop with a mind full of interest in the subject of electricity, his hopes are disappointed and sickened by discovering that he might as well be in a coal yard for any chance there is for him to hear of the subject of electricity or to come any nearer to high mechanical work than drilling holes and washing bottles. "You will doubtless sympathize with and understand this. "Death of Jehl Ends His Story of Edison's Day - Co-Worker, Who saw Birth of Electric Light, Failed to Finish Third Volume. ", Payson Jones, week following 9 Feb 1941, unknown newspaper article.